Trophies are awarded to the first three riders to visit all of the destinations in a state (or region). Click here to see what trophies are available now. Pins and finishers certificates will be given to all who visit a minimum of seven sites. A "Jack Shoalmire Achievement Award" will be awarded to the person visiting the most memorial sites during 2019. 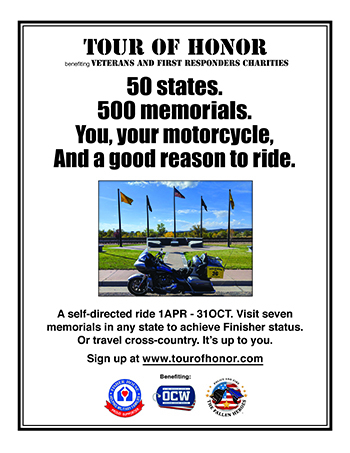 According to rider preference, $25 from each paid registration will go to Fisher House Foundation, Operation Comfort Warriors, or Police and Fire: The Fallen Heroes. All profits after expenses will be divided equally between the three charities. Gold Star Family Memorials - NEW IN 2019! National Parks Tour - NEW IN 2019! RIDE FAR. RIDE SAFE. RIDE TO REMEMBER.